Easy Phone Sync is an easy way to transfer the following to your SamsungGalaxy mobile device: contacts, messages, photos and videos from an iPhone or iPad using theiTunes backup on your computer,- music , podcasts and playlists from iTunes, or- contacts, messages, photos and videos from a Blackberry backup on yourcomputer. The application consists of two parts. One part runs on your SamsungGalaxy device, the other on your PC. In other words and simply stated, this is an easy to use and efficient application functioning as a phone synchronization tool designed specifically for Samsung Galaxy devices. 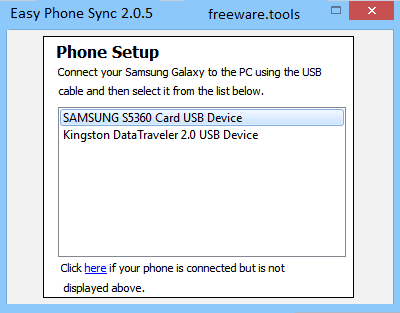 Easy Phone Sync is a user-friendly and intuitive piece of software designed to provide you with a quick means of synchronizing the data from your iPhone with your Samsung Galaxy device, requiring a minimal level of user input throughout the operation. The program is fairly simple to work with, requiring however that you have iTunes installed on your system and running at the same time with Easy Phone Sync. Moreover, you also need to install the equivalent version of this tool on your mobile phone and run it simultaneously on your device, in order to be able to make the transfer of information for iTunes to your Samsung Galaxy phone. Easy Phone Sync makes use of the backup files which are automatically created by iTunes every time you connect your iPhone to the computer, storing all sorts of data, including photos, songs, contacts, calendar entries, emails, notes, messages, browsing activity and countless others, with the exception of items that have DRM protection enabled. This simple utility allows you to populate a new or empty Samsung Galaxy with pre-existing information from iTunes. For this, you need to connect it to your computer through a USB cable and select it from a list, after which the wizard style interface will guide you through every step of the operation. This way, you can quickly switch from your old iPhone to a new Samsung device, with the utmost ease, without suffering any data loss in the process. To summarize, Easy Phone Sync is a useful and quite reliable application that spares you from significant amounts of effort and saves you time by enabling you to transfer your relevant data from a previous iPhone or from your iTunes library to a Samsung Galaxy phone, in just a few mouse clicks.